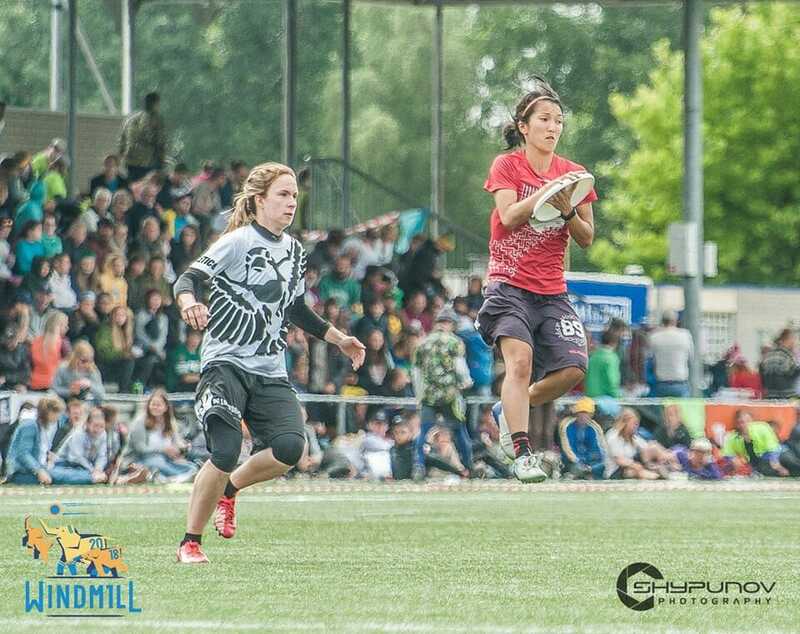 Kyoko Hosokawa of Mainzelmädchen catching a disc in the women’s final at Windmill. Photo by Illia Shipurov, courtesy of Windmill. Windmill wrapped up last weekend. In mixed, GRUT (NED) were able to repeat their 2017 title run, beating a red hot Salaspils (LAT) in the final. Salaspils did not allow any team to score more than eight points on them up until the title game. GRUT had to beat Hässliche Erderferkel (GER) on double game point in the semifinal before getting their chance against the Latvians. Clapham (GBR) defeated CUSB (ITA) in the final, also repeating their 2017 Windmill gold medal performance. This was a revenge match, as Clapham lost to CUSB 15-10 in the Swiss rounds. Ragnarok (DEN) put up a respectable 13-10 against Clapham in the semis before taking 3rd by beating Chevron Action Flash (GBR) in the bronze match. Mainzelmädchen (GER) surprised many by winning the tournament on double game point against reigning EUCF champions Atletico (FIN). Mainzelmädchen also beat 2016 EUCF champions FABulous (SUI) in quarterfinals and YAKA (FRA) in semifinals on their road to victory. There were numerous games streamed live by the Windmill tournament for free on YouTube — here’s the collection of games, many of which feature WUCC teams that will compete in a few weeks in Cincinnati. Comments on "Mainzelmädchen, Clapham, & GRUT Win Windmill 2018"